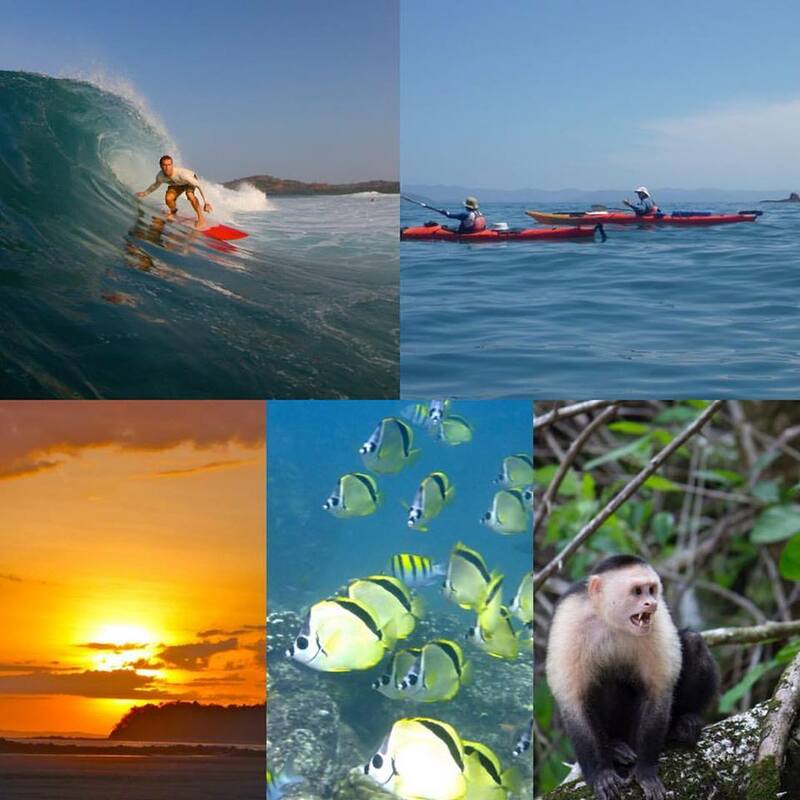 We combine our favourite activities into the ultimate Santa Catalina and Coiba experience. 3 days adventuring around, surfing and chilling in Santa Catalina combined with a 3 day sea kayak excursion on Coiba. We recommend this tour for those that want to experience it all and is also popular with families and groups looking to satisfy a range of interests. Combining 3 days of a surf retreat with 3 days at Coiba allows folks to surf, SUP, snorkel, sea kayak, yoga, camp, observe wildlife and relax..pretty sweet, really! Day 1 - Depart Santa Catalina early morning via boat launch and local captain. Travel 90 minutes along the Pacific Coast to Isla Coiba. Register at the ANAM Station and tour the Natural History Museum. Take a short paddle to a secluded bay to set up our base camp. Enjoy an afternoon snorkel right from our own beach with the potential to see rays, sharks, turtles and puffer fish. Our camp is often visited by capuchin monkeys, herons, kingfishers and hummingbirds. Finish the day with a tasty meal, a beach-side fire and explore the unimpeded night sky. Beach camping. All meals incl. Day 2 - After a hearty breakfast and searching for signs of visiting night life, we set out for a day of paddling. Kayak past a swamp mangrove, before stopping in to explore Mango Beach where you can beach comb for hidden treasures and visit with the Howler Monkeys, black hawks and osprey. Next stop, Isla Granito de Oro to snorkel amongst the diverse species. Finish the day with a paddle back to camp and a well deserved meal and some relaxation before exploring the dusk activity and night sky. Beach camping. All meals incl. Day 3 - After breakfast we will break camp and paddle back to ANAM station where we will have opportunity to enjoy the facilities, hike, bird or relax before heading out by boat to access one last snorkel spot that we could not access by kayak..possibly beautiful Canales Afuera! After our snorkel and lunch we then return back to Santa Catalina in time for an afternoon siesta, surf or explore at your leisure. Hotel of choice. Breakfast and lunch incl. Day 4-6 - Now we set our sights on Santa Catalina’s best! During these 3 days we can use the time to focus mostly on surf lessons and do a complete 3 day surf camp/retreat. If you’re just starting out or looking to advance, 3 days of skill development, instruction and coaching will take your surfing a long way. If you prefer to mix it up, we can also do a mixture of surf lessons, SUP touring, kayak to Isla Santa Catalina, a town tour etc etc. Let us put together an itinerary of adventures that best suits your needs and desires. *Hotel of choice. Breakfast incl. *Hotel of Choice. We like to provide you with hotel options. Some folks prefer dorm style to save money and others prefer to splurge and get a boutique hotel with pool and or restaurant or located close to the beach and some prefer town. For this reason we provide you options. Thus the range of pricing for this tour. Pricing also based on double occupancy. Solo options avail. Need help with travel arrangements or other places to see while in Panama? Let us help. We can assist in arranging private drivers, taxis etc as well as give advice on other areas in Panama to visit. We take pride and enjoy helping folks to facilitate enriching experiences while visiting and exploring the diverse regions of Panama.